Get in touch with nature at Cleland Wildlife Park and Hallett Cove Conservation Park. 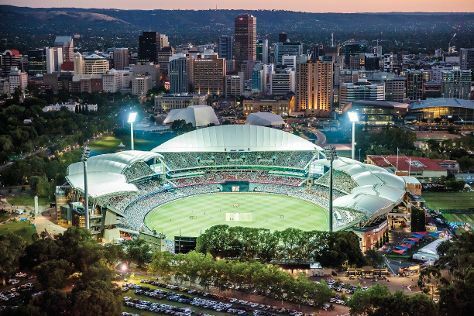 Popular historic sites such as Adelaide Oval and North Terrace are in your itinerary. You'll find plenty of places to visit near Adelaide: Hahndorf (The Cedars & Beerenberg Farm), Greenock (Kalleske Wines & Murray Street Vineyards) and Martindale Hall Heritage Museum (in Mintaro). Dedicate the 9th (Wed) to wine at some of the top wineries in the area. Spend the 24th (Thu) exploring nature at Monarto Conservation Park. There's lots more to do: steep yourself in history at Carrick Hill, explore the world behind art at Art Gallery of South Australia, take in nature's colorful creations at Adelaide Botanic Garden, and step off the mainland to explore Granite Island. For maps, ratings, and tourist information, you can read our Adelaide trip builder . Helsinki, Finland to Adelaide is an approximately 26-hour flight. You can also do a combination of train and flight. Traveling from Helsinki to Adelaide, you'll lose 7 hours due to the time zone difference. Prepare for warmer weather when traveling from Helsinki in January: high temperatures in Adelaide hover around 34°C and lows are around 19°C. Finish your sightseeing early on the 31st (Thu) so you can travel to Cairns. Deepen your sense of the past at sights like Historic Village Herberton and St Monica's Cathedral. Get in touch with nature at Scuba & Snorkeling and Esplanade Boardwalk. Explore the numerous day-trip ideas around Cairns: Cape Tribulation (Daintree Rainforest - Cooper Creek Wilderness & Daintree National Park), Port Douglas (Safaris, Four Mile Beach, & more) and Palm Cove (Palm Cove Beach, Kayaking & Canoeing, & more). Spend the 23rd (Sat) exploring nature at Barron Gorge National Park. The adventure continues: look for all kinds of wild species at Mossman Gorge, head off the coast to Michaelmas Cay, browse the exhibits of Daintree Discovery Centre, and take in the dramatic scenery at Alexandra Bay Waterfall. To see traveler tips, more things to do, maps, and more tourist information, you can read our Cairns trip maker app . You can fly from Adelaide to Cairns in 5.5 hours. Other options are to drive; or take a bus. Plan for somewhat warmer nights when traveling from Adelaide in January since evenings lows in Cairns dip to 28°C. Finish your sightseeing early on the 28th (Thu) to allow enough time to travel back home.